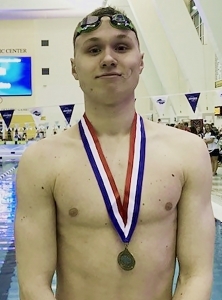 Dunwoody’s Grant Allison took gold in the 100-yard freestyle at the Class 6A state swim meet. It was DeKalb’s first boys’ individual gold since 2016. 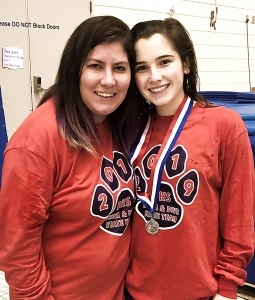 Dunwoody Swimming brought home five medals and a pair of Top 10 Class 6A State Swim Meet team finishes from the Georgia Tech McCauley Aquatic Center last weekend. The Wildcats finished fifth overall in the boys’ standings with 219 points behind the performance of Grant Allison in the 50-yard and 100-yard freestyle events. Allison captured gold in the 100 freestyle with a time of 45.29 bringing home the first boys’ individual gold for DeKalb since 2016 when Chamblee’s John Mitchell swept the 50 and 100 freestyle events. Allison also contributed a silver medal finish in the 50 freestyle (20.82). The Wildcats total was also aided by a bronze medal via Parker Bragg’s third place finish in the 100-yard backstroke (51.82). Dunwoody had Top 5 finishes in both the 200 medley relay (4th, 1:37.12) and the 200 freestyle relay (5th, 1:30.49) that contributed to their Top 5 finish in the team standings. The Top 5 finish for the Wildcats was the 23rd for the team in school history, including four state championships (1976-78, 1984). It was also the second consecutive fifth place finish for the team. Dunwoody dive coach Kyle Srabatta and diver Lauren Davis celebrate a second consecutive silver medal in the Class 6A state diving event. Dunwoody’s Lady Wildcats captured sixth place in the girls’ overall Class 6A state team standings with 192 points, just four out of fourth. Lauren Davis and Ainsley Jones led the way with a pair of silver medal performances for Dunwoody. Davis finished second in the one-meter diving for the second consecutive year with a total of 562.60 which broke the previous pool record at the time. Jones grabbed her silver in the 100-yard breaststroke (1:03.69) and also added more points with a fifth place in the 200-yeard individual medley (2:06.06). Dunwoody had a pair of fifth place finishes coming in the 200-yard medley relay (1:51.30) and the 200-yard freestyle relay (1:41.17). Ashley Altera contributed to the team finish with a sixth place in the 200-yard freestyle (1:56.03) and eighth in the 100 butterfly (58.85). Tucker finished 19th overall in the girls’ standings with 15 points led by an eighth place finish by Marguerite Sesti in the 100-yard breaststroke (1:08.38).